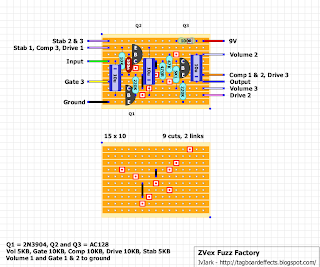 3 knob versions of this higher gain brother of the Zendrive. 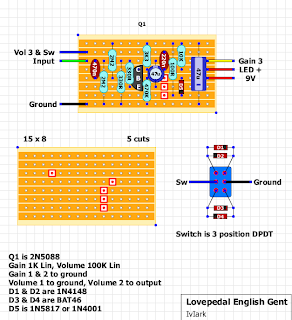 A quicky for you Devi fans. 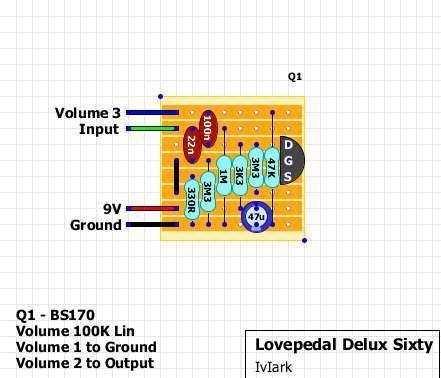 This is actually a really good sounding overdrive for such a low parts count. 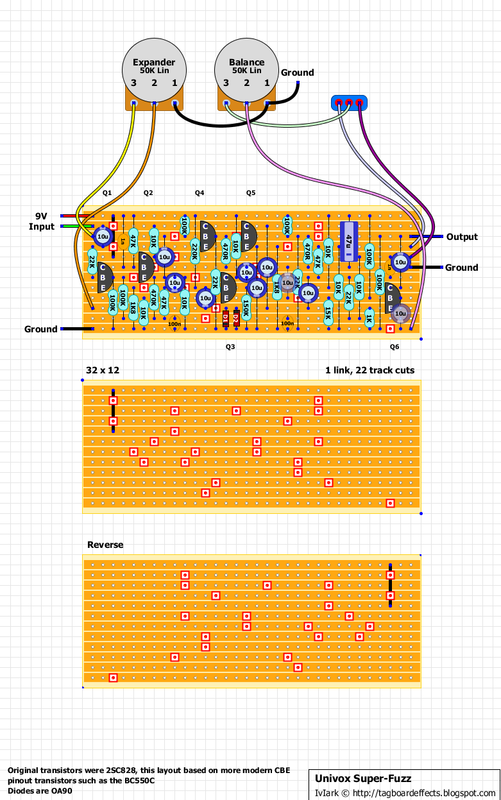 I did a layout for this previously based on a guessed schematic but this is the corrected versions from Devi's schematic. Another one requested by a few people. 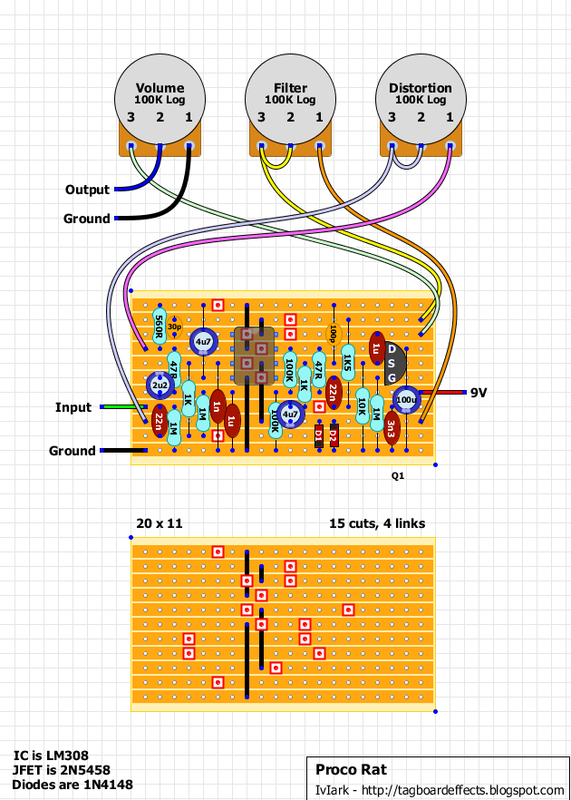 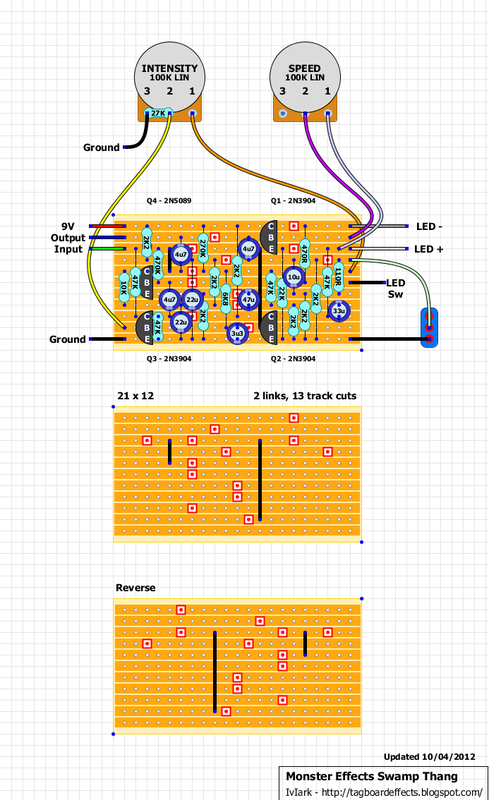 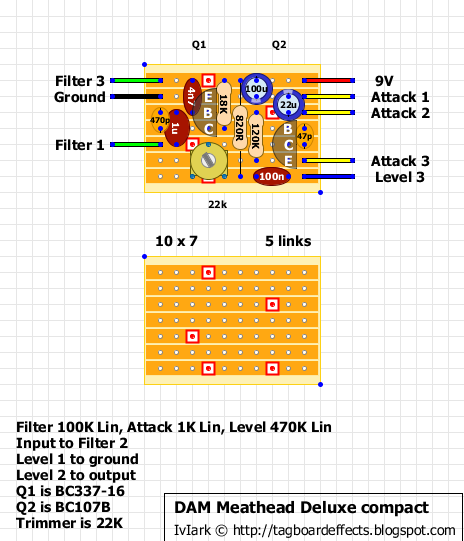 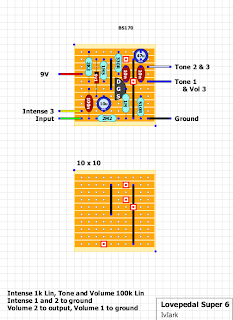 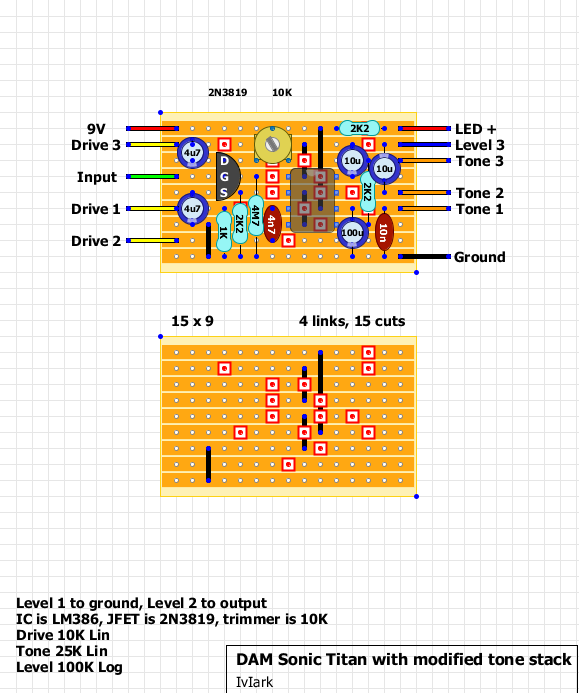 I did a tagboard layout a couple of years ago but it was based on an incorrect schematic so I pulled it and have been meaning to do this one for a while now. 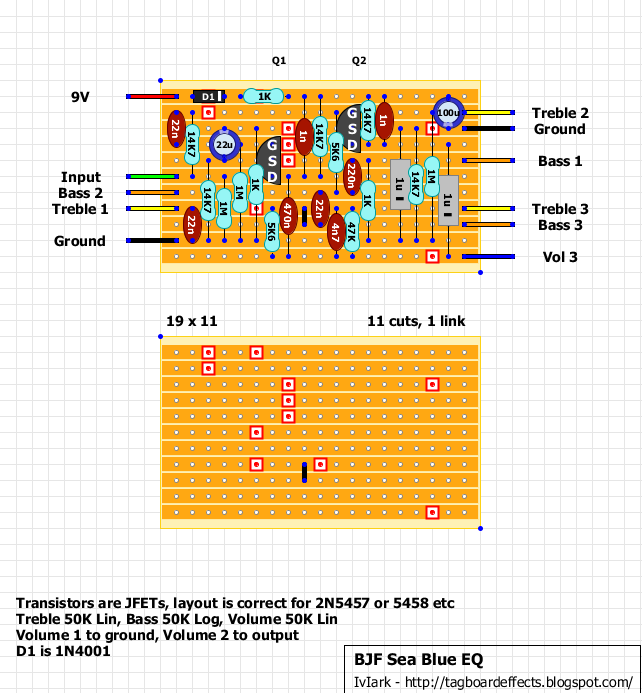 Is that the lot yet? 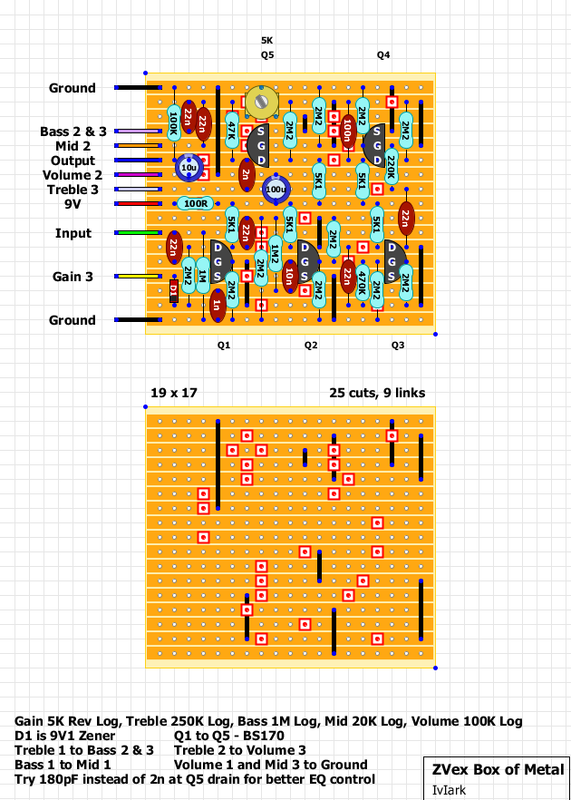 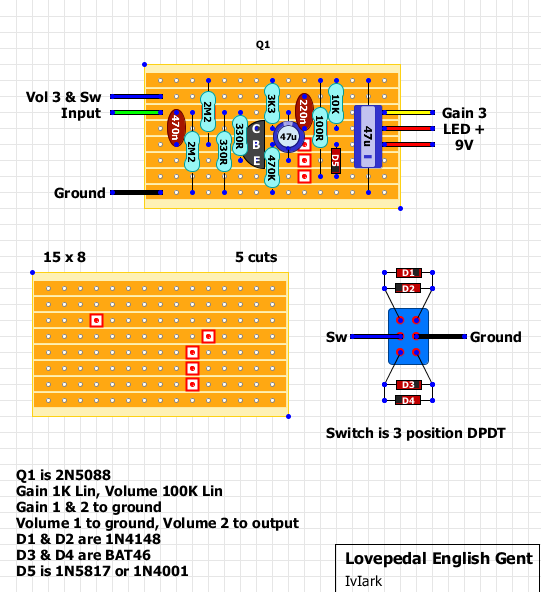 I wanted to try this one out with a quad opamp and so thought I'd put together a couple of layouts, one for the 1977 version and one for the 1978 version with a tone bypass switch. 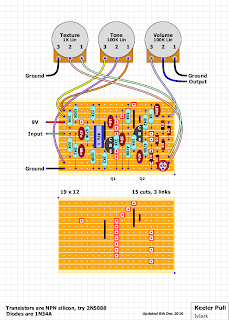 I have done a version of the 77 with all the diodes laid out on the board, but to keep the width down to allow this to be mounted in a 1590B box I decided to simplify the diode layout, so D1 and D4 are each 3 x 1N4148 diodes in series. They're small enough to allow you to make these groups of 3 up yourself (and maybe cover them with shrink tubing) without looking unweildy on the board, so I thought it made the most sense to keep the layout as compact as possible. 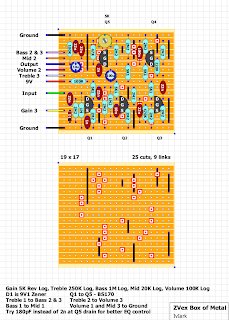 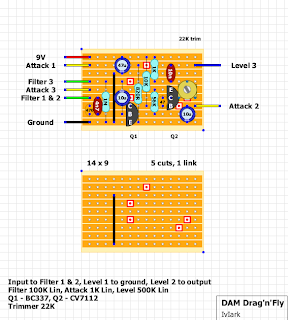 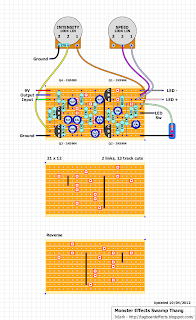 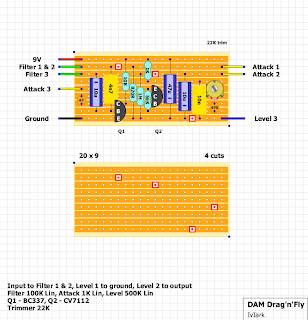 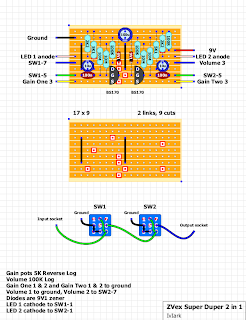 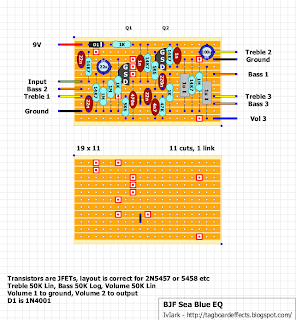 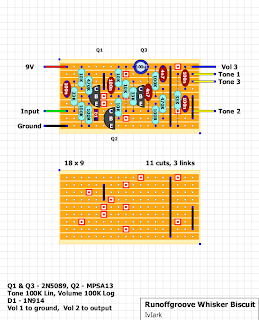 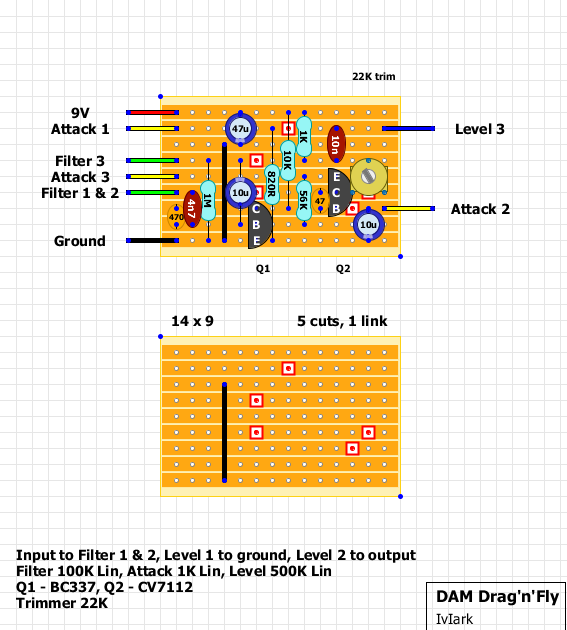 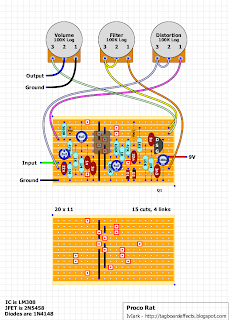 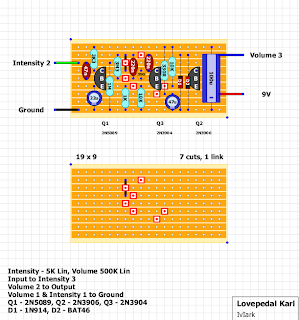 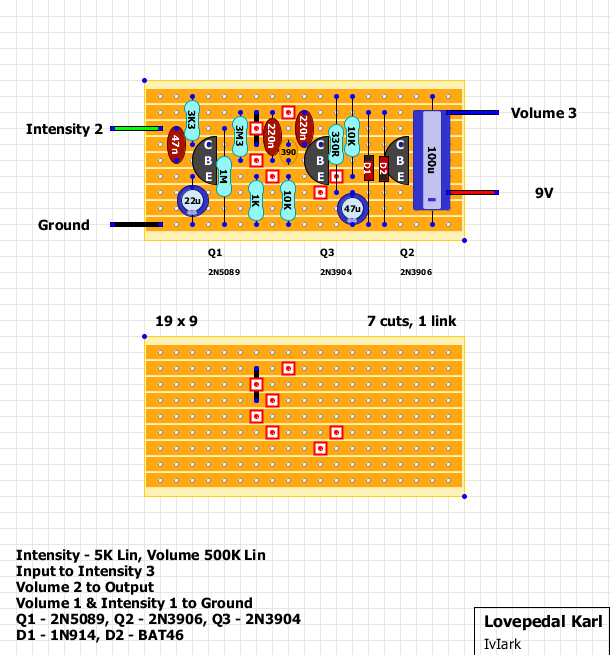 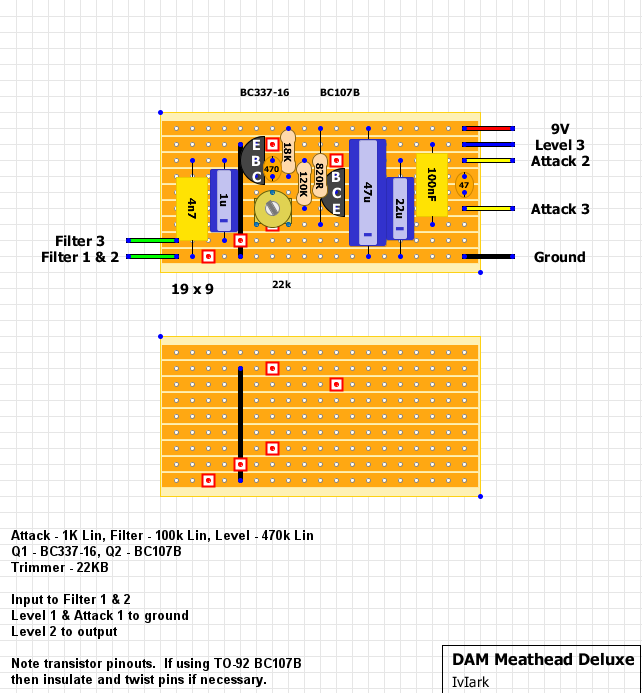 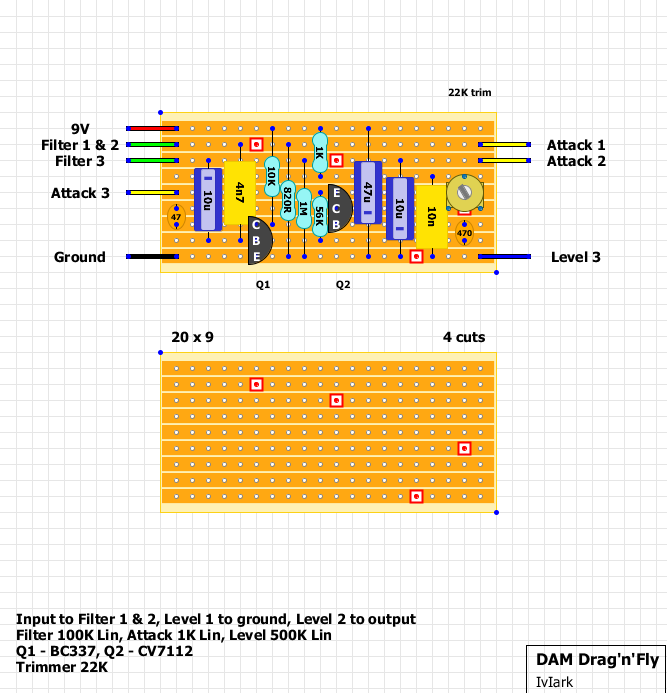 Both layouts were put together with the TL074 opamp in mind, but if you use a non-fet based quad opamp then the 1M resistor from pin 10 to the supply rail should be changed to 820K. 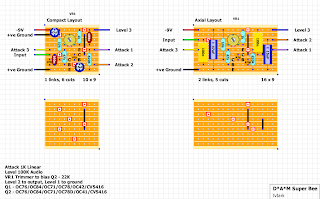 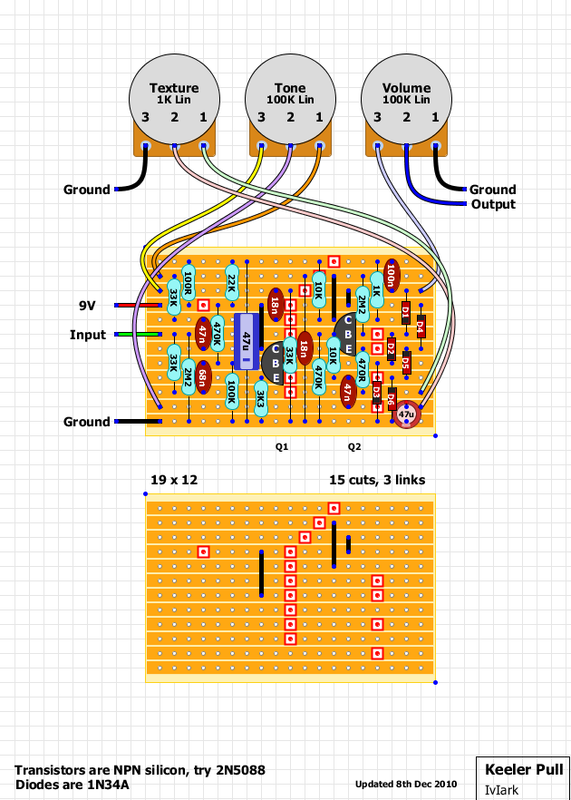 Layouts were based on analogguru's schematics but are currently unverified, so if you build this up then please let us know how you get on. 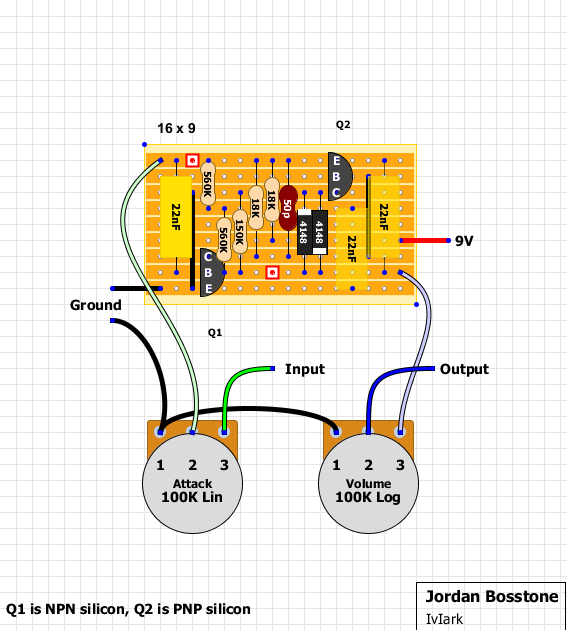 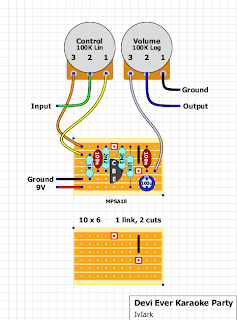 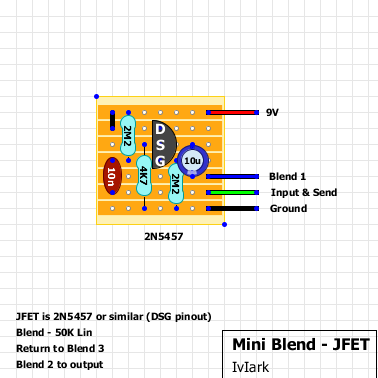 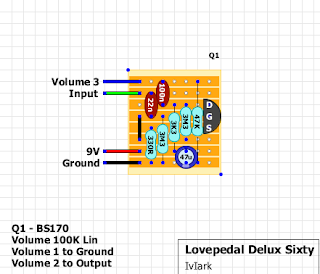 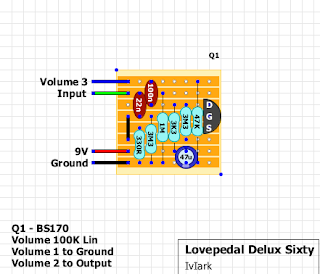 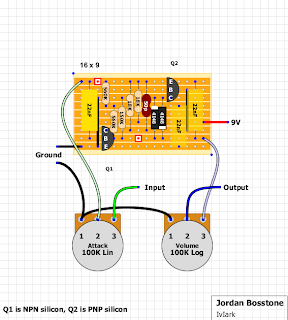 Will easily fit in a 1590A box and I probably wouldn't even use a stomp switch with this because in the unblended position of the pot, this will essentially be just a JFET buffer. You could always add a mini toggle to bypass it completely if you wanted to. 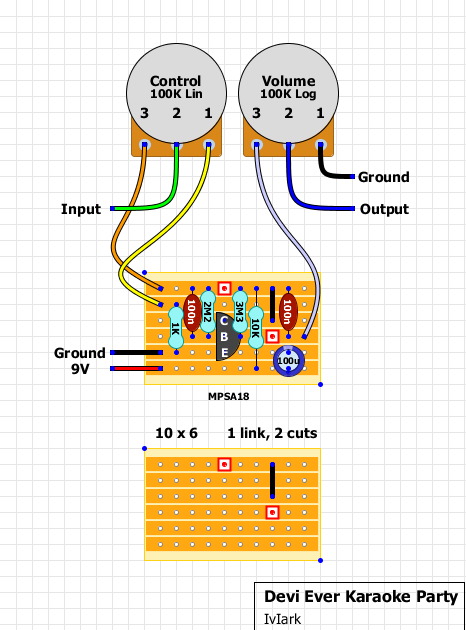 This will make a useful little tool to experiment with blending dry and effect signals together, or to allow you to use a digital effect 100% wet so your dry signal isn't being digitised. 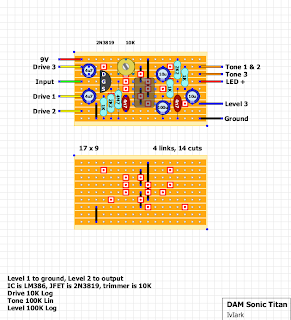 I posted this a while ago but someone said they had a problem with the build and so I pulled it and then promptly forgot! 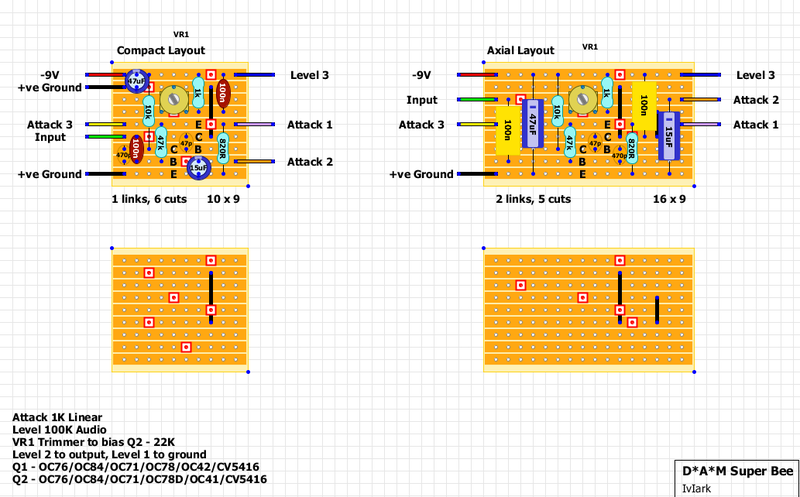 I've just noticed that since then the same guy confirmed the layout is good so I may as well post it up again. 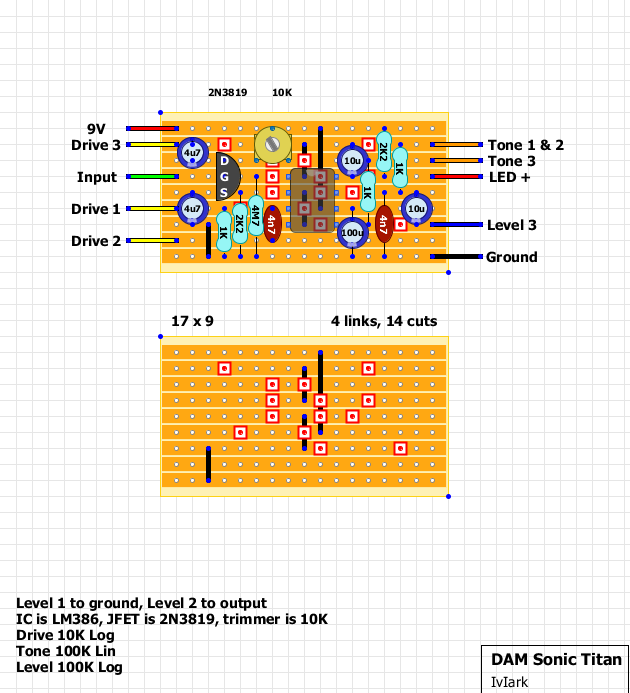 A few people don't like the tone control on the Sonic Titan, so this is a modification based on Skinpimp's Sonic Samurai. Apart from the tone stack modifications, all the other Titan components and values remain true to the original. 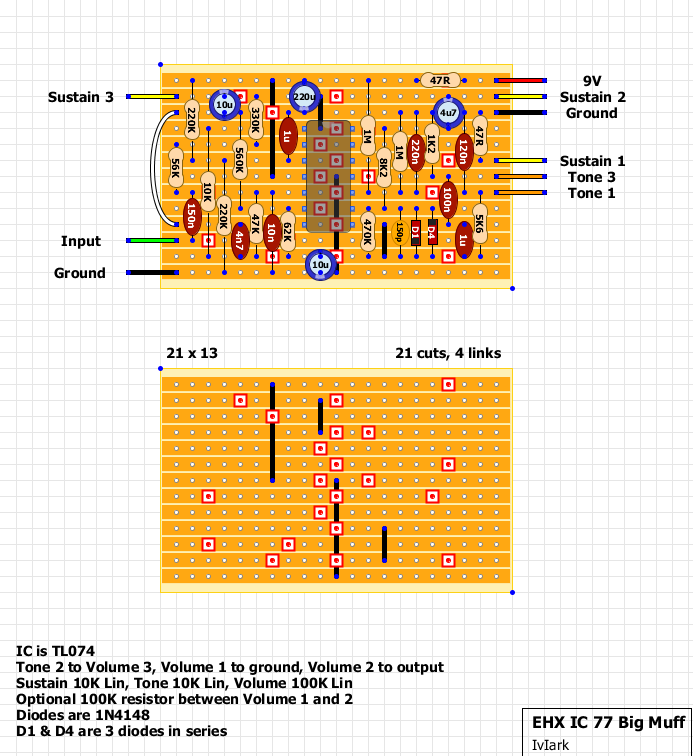 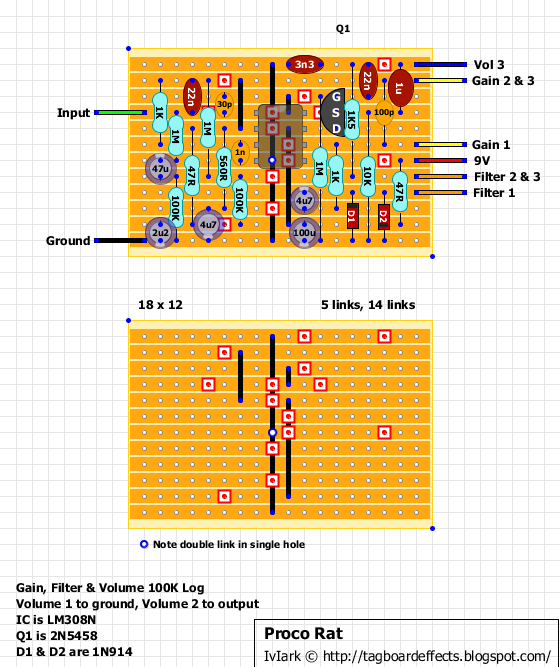 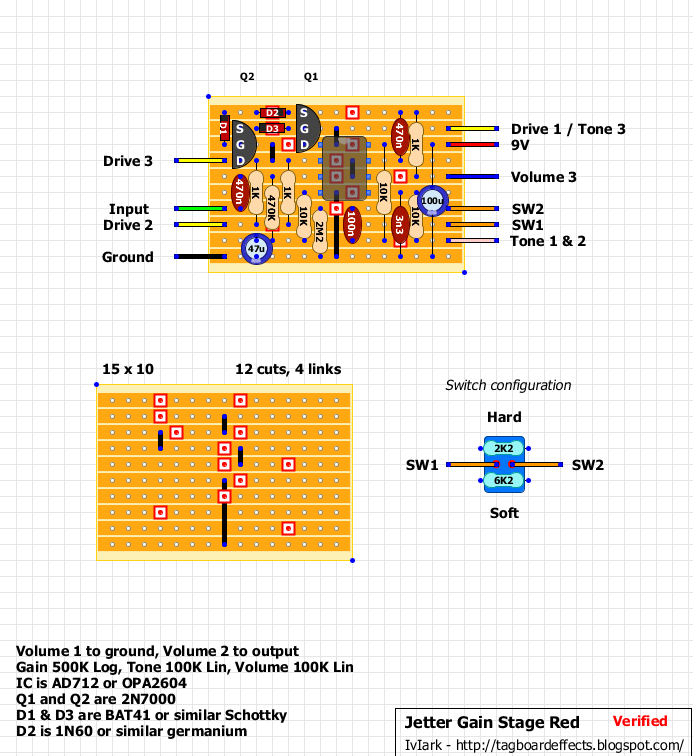 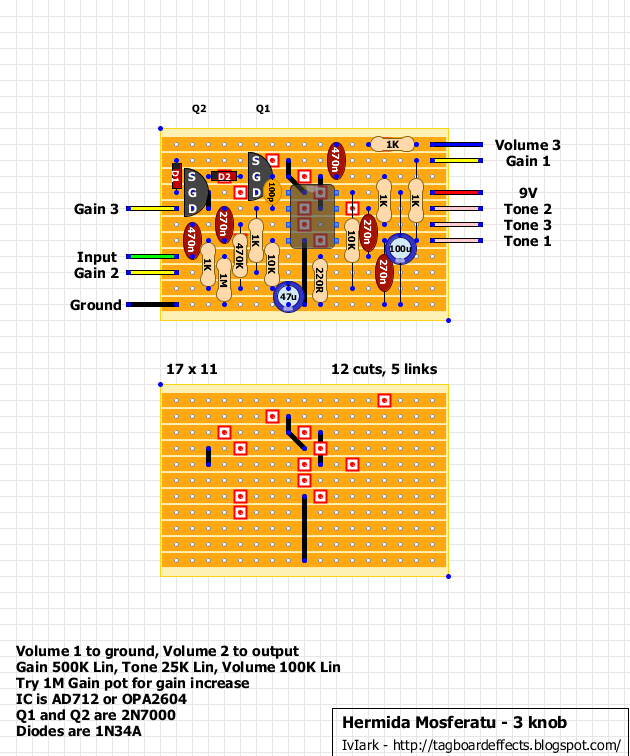 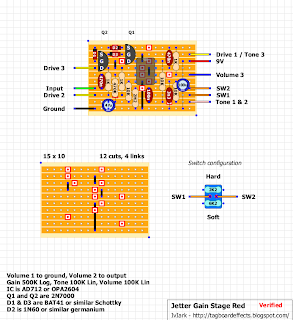 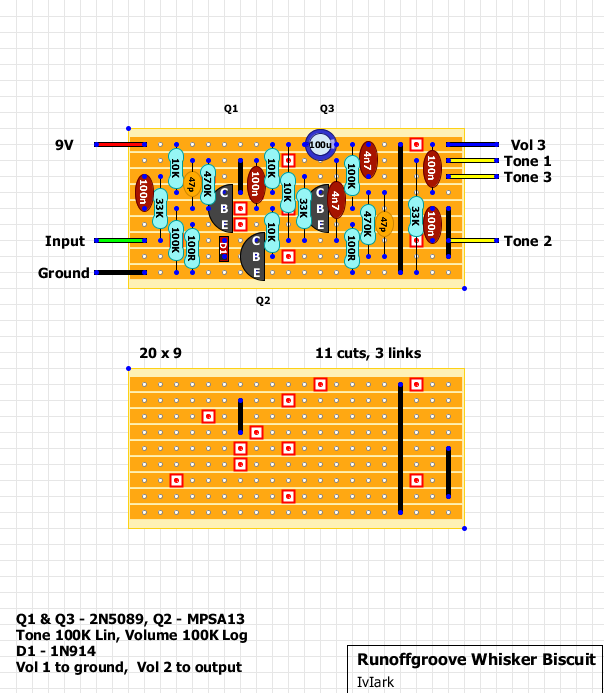 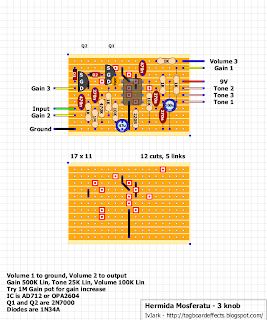 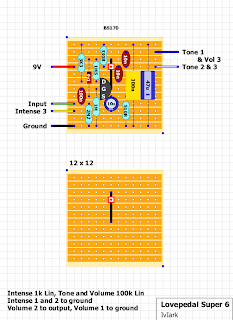 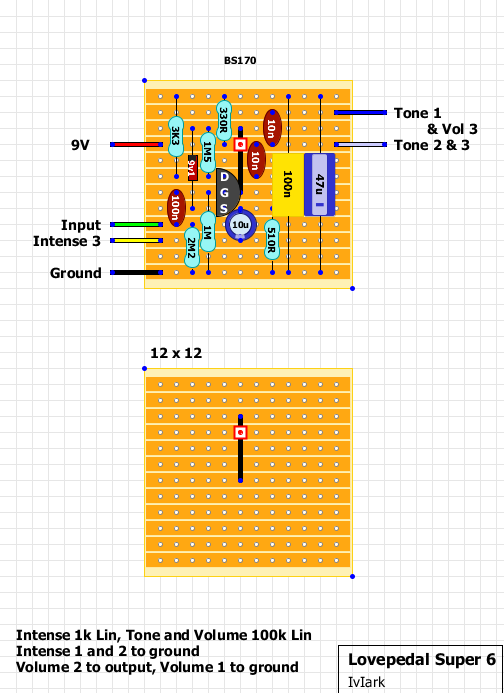 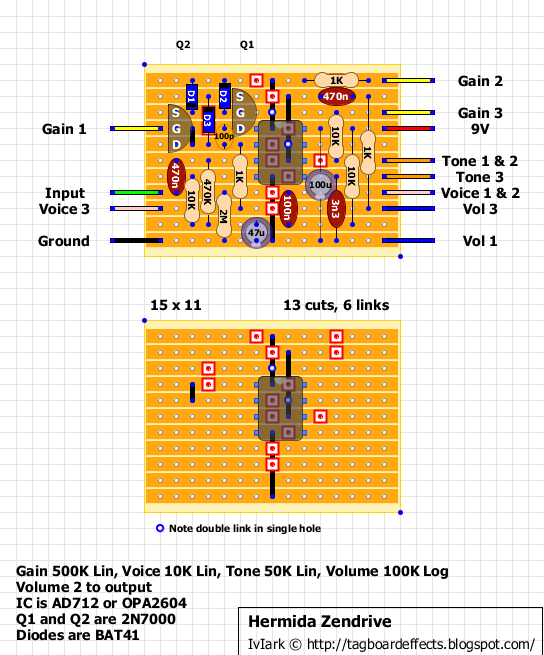 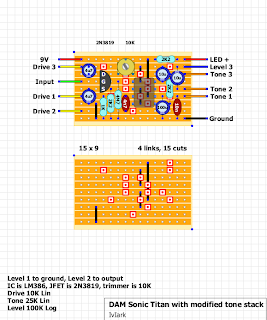 I did a mojo axial layout for this a while ago and wanted a more compact layout too, so here it is. 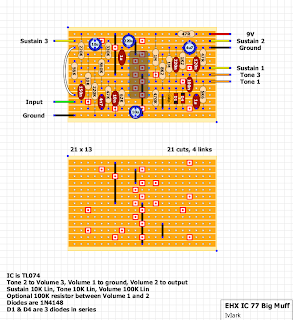 If anyone wants the axial version let me know and I'll dig it out and post it as well. 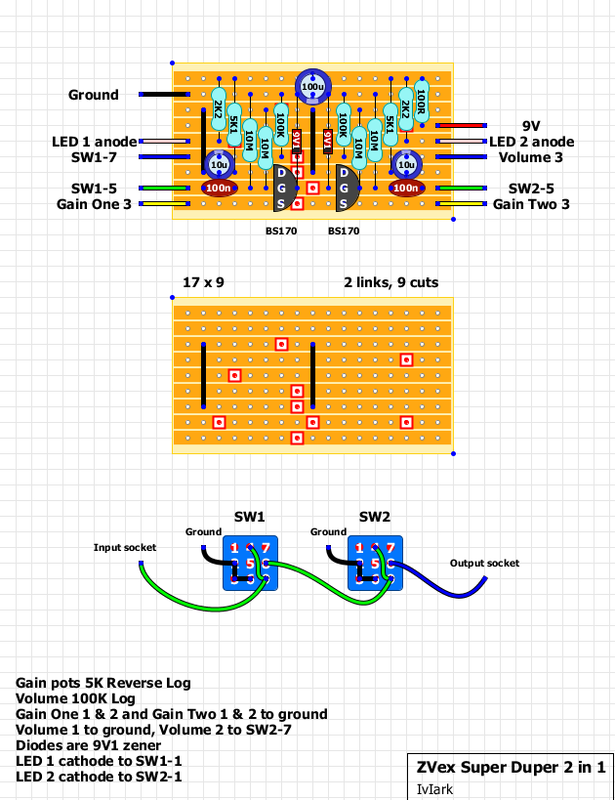 A few people have requested this so I thought I'd get one put together. 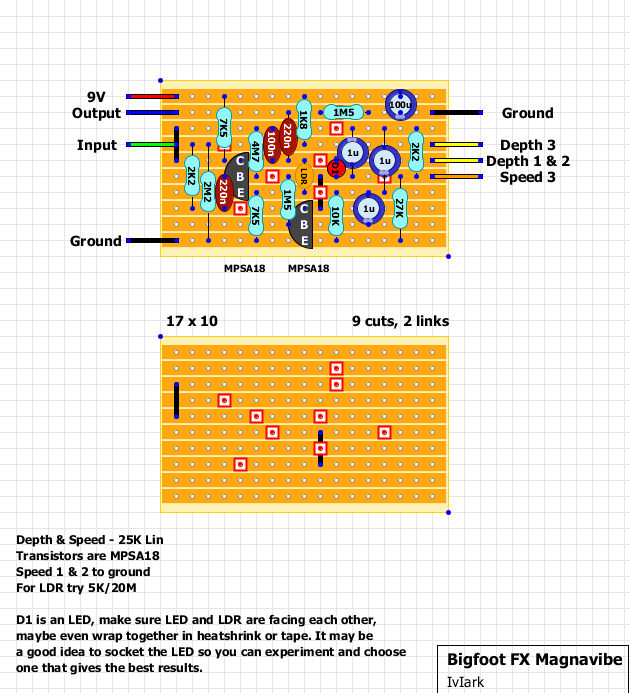 Based on my previous layout but with some obvious differences due to component changes. 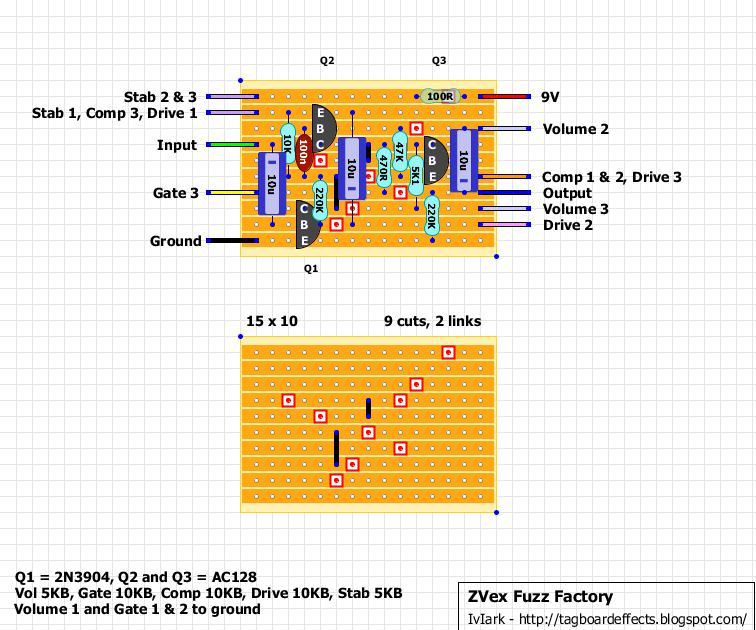 One requested by fx40b and including two layouts, one compact and one for DAM type axial mojo goodness! 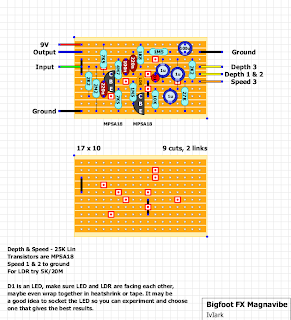 This isn't yet verified and so if you make it successfully then please let us know.